The comedy drama Beginners got lots of acclaim when it was in theaters, thanks in large part to its leading actors. 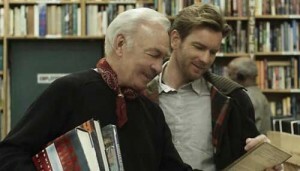 Ewan McGregor (The Ghost Writer) plays graphic designer Oliver, whose life comes unhinged when his elderly father (Christopher Plummer, The Last Station) makes two announcements — he has terminal cancer and he has a young male lover. Oliver realizes how much of a beginner he is about romantic love when he meets the free spirited Anna, played by Melanie Laurent, who wowed us in Inglourious Basterds. The movie’s cast also includes Goran Visnjic who first earned attention in TV’s ER. Beginners is the second feature film from writer-director Mike Mills, since 2005’s Thumbsucker. Rated R, Beginners was called “immensely moving, funny and involving” by the UK Guardian. The movie had only a limited release to theaters in the U.S., but grossed a respectable $5.8 million during its run. On DVD and Blu-ray, it will have a bigger audience.